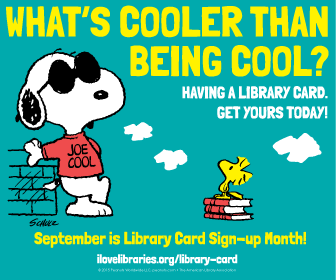 What's New @ Roselle Public Library: Be Cool Like Snoopy! Library Card Sign-Up Month starts tomorrow! Kids who get a new Library card during the month of September will receive a complimentary book and be entered into a drawing for additional giveaways! Kids who *use* their Library card during September will have opportunities for more giveaways! We haven't forgotten the adults... the first 50 adults to sign up for a Library card will receive a complimentary copy of The Coast of Chicago by Stuart Dybek, this year's "On the Same Page" book. Roselle Public Library is located at 40 South Park Street, Roselle, IL. Call 630-529-1641. Press 2 for more information.